Benedict Cumberbatch’s cockney cousin umpteen times removed wants to get his hands on the TARDIS keys when Peter Capaldi leaves that show. Royalty-gone-wrong Danny Dyer says he could even keep his diamond geezer accent. 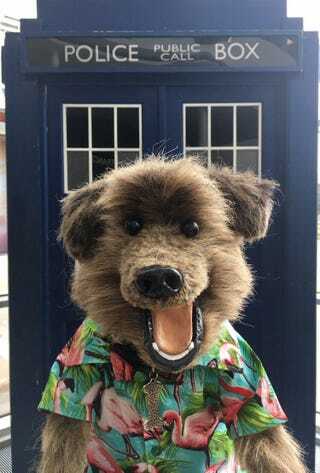 But another contender is putting his paw in the ring, CBBC mascot Hacker T Dog (who came second on Celebrity Mastermind) thinks a Wigan wanderer would be a better choice for the time lanes. He has even pinched one of John Nathan Turner’s shirts to prove his point.